When politicians don’t want people to notice what they’re doing, they often do it at a time when they think few are paying attention. So it was no surprise that Gov. Rick Snyder chose to sign the highly controversial Senate Bill 661 on the Friday between Christmas and New Year’s, when most folks’ minds weren’t on public policy. The bill did a number of things, such as doubling the amount of money individuals can give to a candidate. But most of all, it was carefully crafted to block Secretary of State Ruth Johnson – or anyone in the future – from forcing disclosure of who pays for the so-called “issue ads” that every election become more and more influential in Michigan politics. The governor issued a press release after he signed it, claiming the bill will “bring an unprecedented level of transparency and openness to the state’s political system.” That evidently refers to a provision requiring disclaimers identifying sponsors of those much-hated campaign “robocalls” that clog our answering systems. Whatever anyone says, signing this bill was a disgraceful abandoning of a principle he told us he believed. It is clear that Michigan politics in recent years have been swamped by a tidal wave of “dark money,” millions and millions of anonymous dollars spent on political ads by an astounding number of committees, whether candidate, party election, 501(c)3 or 501(c)4 “nonprofit” groups. Since 2000, more than half of all spending on Michigan Supreme Court campaigns has been undisclosed, including more than three-quarters of all spending in the 2012 campaign, according to the Michigan Campaign Finance Network. Who’s paying for all those ads? We don’t know. But we do know that the sharpies who sponsor them expect something in return. Without knowing who they are, we’ll never know what they want, and can’t even warn the citizens about their growing influence. Those who favor this new law, now Public Act 252, argue this way: They say requiring disclosure of who pays for these ads threatens the donors’ free speech rights, and subjects them to harassment and possible intimidation. The truth is this: When you cut through all the double talk, the only freedom put at risk by requiring public disclosure of those who pay for political ads is the freedom of special interests to launder money in secret. As to allegedly “improving” campaign finance reporting, that funny sound you hear in the background is all the lawyers figuring out loopholes in the law. I’ve always thought the clumsy and slow regulations are never going to keep up with smart people figuring out how to beat the law. The policy solution is simple: Place no limits whatsoever on campaign expenditures of any sort, but require instant public disclosure of whoever is contributing to any campaign. Simple, yes? Well, regardless of whether this ever happens, Snyder’s political dilemma is more complicated. He ran as a self-proclaimed moderate centrist and won votes from a lot of independents and even a few Democrats. This decision won’t set well with those folks – and antagonize others increasingly worried about the governor’s drift to the right. I agree wholeheartedly. Anonymity is a shield for influence-buying. It also immeasurably coarsens the public discourse. Look at what happened when Letters to the Editor (for which the newspapers required full name and address and called for confirmation before printing) morphed into anonymous on-line commenting. Our politicians have to know that, in the not-so-long run, these shenanigans undermine public confidence in our system of government — and especially in the fairness of our jurisprudence. But they do not care, as long as their re-election is thus assured. "Whatever anyone says, signing this bill was a disgraceful abandoning of a principle he told us he believed." DITTO, writ large. How can we continue to ask our institutions to be more transparent at the same time we allow the most important aspect of the control of government to hide behind these laws. You're too kind to Michigan's governor. He's not just "drifting to the right," he's projecting the appearance of being bought and paid for. This guy lost me on right to work and I voted for him. It's one thing to disagree on a policy which happens all the time. But that piece of legislation was rammed through at the eleventh hour with no public comment or hearings in a complete subversion of the democratic process. A "tough nerd" doesn't mean you don't value the democratic process. He appears to have been coopted by the entrenched powers in Lansing which is extremely disappointing. Power scratches where it doesn't itch. Anonymous political commentary and funding were the very basis of the American war of Independence and early government. Thomas Payne published his Common Sense, the authors of both the Federalist and Anti-federalist papers all wrote under pseudonyms. They feared reprisal from corrupt and powerful government officials who had the power of life and death. I note with some sadness that the supporters of "The Bridge" are not named anywhere; possibly they fear loss of business or of reputation if certain unscrupulous Republicans were to get even. The current debate revolves around "outing" donors for advertising political campaigns, usually those of the underdog or the challenger, in which unsavory details about the incumbent emerge. Usually these challenger campaigns fail, and the incumbent continues and now has the power to reward his supporters and punish his detractors. It is this later abuse that the provisions for anonymous donations to campaigns is meant to protect. Absent this provision, donors will be intimidated and we will never hear about the underhand dealings of entrenched politicians. Voters will be denied necessary information and the whole rotten system continues. Honest politicians don't worry about their opponents ads. If someone lies about their record they have access to the courts. Politicians worry about being "swift boated" a la John Kerry in 2004. He lost by 3 million votes, namely the 3 million veterans of that conflict who knew a sleaze ball when it was pointed out to them. 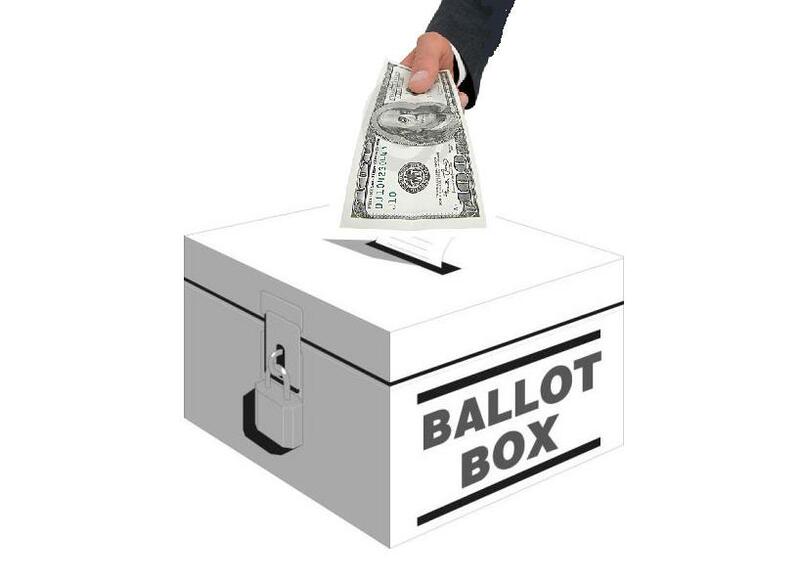 Those politicians who fear anonymous campaign contributions should clean up their acts. Media types want to know who paid for what politician so that they can make livings by firing up the paranoia of the simple folk. There is also an element of Voyeurism, but these do not justify interfering with normal democratic processes that cleanse the body politic of entrenched bullies. Sorry, Erwin, but your mischaracterization of history and your convoluted arguments in favor of obstruction and anonymity merit a repeat of Phil's observation: "Nonsense!" To lump the very real threats against life and liberty to which the Founding Fathers and Thomas Payne were subject with some possible, as-yet unevidenced "harassment" is to do an enormous disservice and disrespect to those who fought for the freedom to know who is behind the laws that oppress them. And why is Mike R anonymous, as are many of the commentators here? I do seem to remember that Pres. Johnson and Nixon regularly subjected their foes to Income tax audits. And let's not forget the current President using the IRS to prevent Tea Party groups from organizing; else he might have lost this last election. You could consider Pres. Obama's disruption of his detractors' political activity as a kind of pro-active strike, an inverted campaign spending anonymity, using his power to prevent them from ever spending any money. Erwin, Did you not read Bridge's website? It presents, in living color and rotating graphics, precisely who funds Bridge. In addition, Bridge and The Center for Michigan regularly issue news releases thanking new and current funders. You could not be more wrong on your logic, your (mis) understanding of history, and your assertion that Bridge and The Center do not disclose their financial supporters. This action of the governor prompts this independent/Democrat leaning voter to pay closer attention to the 2014 elections in Michigan. Many of Governor Snyder's views led me to deviate from my usual political loyalties to support his candidacy initially. I was glad to see his support of early childhood education and hoped he could convince the legislature to abandon its tax increase aversion to funding improvement of our roads and bridges, in spite of being very disappointed in his support of anti-women's health issues. However, I cannot vote for the governor who supports one of the greatest threats to democratic government, the ability of private interests to buy elections. When the governor violates his stand on transparency in government, he loses my vote. This definitely makes one wonder how deep in the Koch brother's pocket Rick Snyder is! He got elected saying he would keep the crazy wing of the GOP caucus under control and hasn't done it. I heard former ambassador Weiser give the most mean spirited victory speech at he celebration in 2010, talking about how the GOP would stick it to labor, teachers, women, gays, etc. now that they had the entire Michigan government in their control, and felt nearly physically ill at his words and attitude. Now it is all coming true, and I feel ill every time I think about Rick Snyder, and the fact that I contributed to his primary campaign thinking he meant it when he said that he would steer a neutral course. All lies! The only thing we can do now is go out and support the Schauer campaign, and efforts by the Democratic party to gain seats in the legislature, with donations, and volunteering. His promise to be transparent is fully in tact. People can see right through him and his dark of night deals are so obvious. We need more watch dogs and disclosure in all areas of government What ever happened to public hearings and the right of the public to hear what is proposed and provide their input? Just be reminded that always treat those on your way up kindly,,for you may meet them on your way down. I want to congratulate Phil Power for his forceful, plain-language condemnation of Governor Snyder's lack of spine, intellectual dishonesty, and apparent belief that Michiganders haven't read Orwell's 1984 (“Doublethink means the power of holding two contradictory beliefs in one's mind simultaneously, and accepting both of them.”). I did not vote for him, but I had high hopes that this seemingly moderate Tough Nerd would be the breath of political fresh air that Michigan needed at a critical time. I'm very sad and disappointed to say that he further dashes those hopes and belies his carefully-spun moderate image with each grand promise broken, each treasured right infringed, and each hard-earned dollar stolen from the pockets of the many and slipped into the pockets of the few. Mr. Power, I'm afraid Governor Snyder would disagree with your statement, "The policy solution is simple: Place no limits whatsoever on campaign expenditures of any sort, but require instant public disclosure of whoever is contributing to any campaign." Here is Snyder's impaired logic on disclosure from an oped that accompanied his signature on this awful law: "History has shown that disclosing donors’ names results in the use of scare tactics that are designed to suppress speech and participation in the political process. That, to me, is contrary to everything we stand for as a free society and cannot be tolerated." Of course he can't cite any such history and the only other place I find the claim being made is from the Koch brothers themselves in a Forbes profile circa 2010. Rick Snyder continues to disappoint me on so many levels since the hopeful beginning of his tenure three years ago. He did the State a big favor with the substantive transformation of the business tax and threw a few bones at environmentalists but other than that it's been mostly down hill. I'm looking forward to a change this coming November. "I do not agree with what you have to say, but I'll defend to the death your right to say it." Voltaire. Here is the rub. If I do not know who is saying it, How can I defend it. In modern terms there is a thing called a disclaimer. The disclaimer should be attached to all political ads stating the entity making the ad and a WEB site listing all contributors to the 501c3, 501c4, or 525. This should be the law. If I contributed to the DNC or RNC, American for Prosperity, Move On or any such organization, it should be public Knowledge. A reoccurring concern of mine is how Mr. Power seems to show a of respect for the capacities of his readers. When he writes it is as if he doesn’t feel the reader can reason for themselves, he tells them how to think but never encourages them to think. He never offers the why, he never describes the consequences, doesn’t show interest in others concerns, he has his answer and will bridge no other. When I try to think about an issue I start with my concerns, look to ways to address them, I try to consider the consequences (particularly the unintended ones), and I try to descript what I would like things to be. I believe Mr. Power is a thoughtful person so I wonder how he looks at this issue. Does he feel that those receiving contributions are selling their votes, does he feel that the individual donors should be the focus of campaigns rather than the candidate or issues, does he believe that being a campaign donor must become an act of courage so only those willing to take public scrutiny and whatever else a loss of privacy brings will contribute to a campaign? How does he expect public scrutiny of every donor will change the election process? I support the idea of each donor being on the public record and yet I am concerned with how it might affect elections and the availability of new candidates with donors’ scrutiny possibility becoming more visible than the candidate themselves. Will the people’s desired for privacy discourage them from participating in the election process and leaving campaign donation to those who are insulated (not caring) from public scrutiny? Will the availability of donor names put them in jeopardy of personal harassment (from the campaign solicitation, to picketing at their homes and neighborhood rumor mongering)? If Mr. Power’s view is implemented as is and it discourages individual donors will that elevate the monetary value of public media platforms with their bias on issues? I would like to hear about what they unintended consequences might be and how they could be addressed/mitigated, Mr. Power doesn’t seem to have interest in such concerns. Why does he believe that the most important issue (measured by number of articles he has written) in Michigan politics today is donor transparency? Please note that donations directly to candidates still must be identified by the candidate's campaign committee. It is those "issue ads" that do not profess to support for a candidate and over which the candidate supposedly has no control that are allowed to flourish without identifying the donors. As sample might be: "Rick Snyder signed legislation doubling the allowable campaign donations to candidates for public office and keeping donors names secret. Call Rick Snyder and tell him you are disappointed in his actions." I ask why this ad should allow donors to hide their names and one that says "Elect Rick Snyder to a second term as governor of Michigan." would require disclosure. I wrote to Senator Geoff Hansen about this issue and was fed the same old "potential retaliation" fodder as Gov. Rick espouses. Sen. Hansen used donating to the NAACP during the civil rights unrest of the 1960's as an example. Well yes, it takes courage to stand for what you believe in. And there very well may be some form of "retaliation" for your stance. However, if you are a businessman funding some advertising for a cause that may harm me, I have every right to decide not to spend my hard earned money at your place of business. And I have the right to know who you are. My name is at the head to this post. Come and get me. So why not eliminate the privacy of the voting booth while you're at it? The consequences of supporting an unpopular cause are no less real any that are face by a voter. Where would we be if those individuals who signed the Declaration of Independence had declined to be identified? Barry, So you believe that every voter must demostrate the courage of the singers of the Declaration of Independence, "we mutually pledge to each other our Lives, our Fortunes and our sacred Honor". I believe that those signers took that risk so every election did not have to require that degree of courage. I wonder if you truly do feel you should have to exhibit that level of courage for every vote in your community. I if you know that many people who possess the courage you feel is necessary to have the right to vote. Most of us don't have the courage you speak of, that you have. I don't believe that level of courage should be a criteria for voting.